Dr Diego Kaski MBBS PhD is a Consultant Neurologist at University College London and the National Hospital for Neurology and Neurosurgery in London, and an honorary Senior Clinical Research Fellow at Imperial College London. He has a special interest in Neuro-otology having completed a PhD at Imperial College London investigating the cortical mechanisms underlying human spatial navigation under the supervision of Professor Bronstein. He set up and ran an acute vertigo service in Charing Cross Hospital, London between 2009-2012. He has also undertaken extensive research into the cortical mechanisms of human spatial orientation, and the application of non-invasive brain stimulation techniques in the treatment of neurological balance disorders. Professor Linda M. Luxon trained in Medicine and Neurology at St Thomas’ Hospital, the Middlesex Hospital and Queen Square. She was appointed the first NHS Consultant Physician in Neuro-otology at the National Hospital and undertook a Fellowship at UCLA. In 1991, she was appointed to the Chair of Audiovestibular Medicine at the University of London, based at UCL. She has served as Chairman / President of a number of national and international professional bodies and have been particularly involved in the development of audiovestibular medicine and neuro-otology in the UK and worldwide. Her research interests include both peripheral and central auditory and vestibular disorders and she is currently the Principal Investigator of an EU grant entitled EMBalance. She is a Trustee of three medical charities and has been Treasurer at the Royal College of Physicians since 2010. Miss Amanda Male is the Highly Specialised Vestibular Physiotherapist working at the National Hospital for Neurology and Neurosurgery, and has led three vestibular rehabilitation services over an 11-year timespan, across both private and NHS domains. She has a strong evidence based ethos and passion to develop others and her own knowledge and skills. She regularly develops course programs, runs national events, supports colleagues nationally and has experience marketing services as well as developing evidence-based protocols. She is passionate about Vestibular rehabilitation and has completed a Masters Research project in BPPV management to further assist in improving patient care. Professor Adolfo Bronstein MD, PhD, FRCP, FANA is Professor of Clinical Neuro-otology at Imperial College London and a Consultant Neurologist at Charing Cross Hospital and at the National Hospital for Neurology and Neurosurgery, Queen Square, London. He heads the Neuro-otology Unit in the Division of Brain Sciences at Imperial College. He has written over 250 papers on clinical and basic aspects of eye movements, balance and spatial orientation. His book, ‘Dizziness’ received a ‘High Commendation’ at the 2008 BMA Medical Book prize Competition. Prof Bronstein is an enthusiastic teacher of neuro-otology and balance disorders in European and world neurological societies. In 2008 he obtained the Nylen-Hallpike Prize of the Barany Society for outstanding contribution to clinical neuro-otology. His current research interests are the high order mechanisms involved in central compensation of peripheral vestibular disorders and the role of small vessel disease in dizziness in the elderly. He has been chairman of the neuro-otology panel for the European Federation of Neurological Sciences and president of the clinical neuroscience section of the Royal Society of Medicine. Dr Louisa Murdin is Consultant in Audiovestibular Medicine at Guy’s and St Thomas’ NHS Foundation Trust and Honorary Senior Lecturer at UCL Ear Institute, London. She studied medicine at the University of Oxford before further in training in the UK and Australia. She has research interests in vestibular migraine, Meniere’s disease, and audiovestibular manifestations of systemic disease. She also works with the NIHR and Cochrane ENT group on development of evidence based practice in Vestibular Medicine. 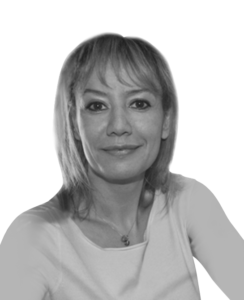 Professor Doris-Eva Bamiou MD MSc PhD FRCP is Professor in Neuroaudiology at the UCL Ear Institute, and Consultant in Audiovestibular Medicine at UCLH and Great Ormond Street. Her PhD is on auditory processing in patients with structural brain lesions. She received the Pat Jobson Prize of the British Association of Audiological Physicians (2002) and the Edith Whetnall prize of the Royal Society of Medicine (2012). She is Director and Organiser of the APD advanced masterclass (UCL) for several years, Programme Co-Director of the MSc in Audiovestibular Medicine (UCL) and Editor of the eBrain Neurotology section. Her research interests include clinical presentation of APD in normal subjects and after stroke, auditory rehabilitation after stroke, and customised balance rehabilitation.